When I was a volunteer at Ellis Island National Monument one of my favorite stories to tell was about the site’s jurisdiction. The short version is this: Ellis Island is actually situated in New Jersey waters. For years the Garden and Empire States argue over which can lay claim to the site. Being good American, they sue. Eventually the matter ends up on the docket of the U.S. Supreme Court itself. 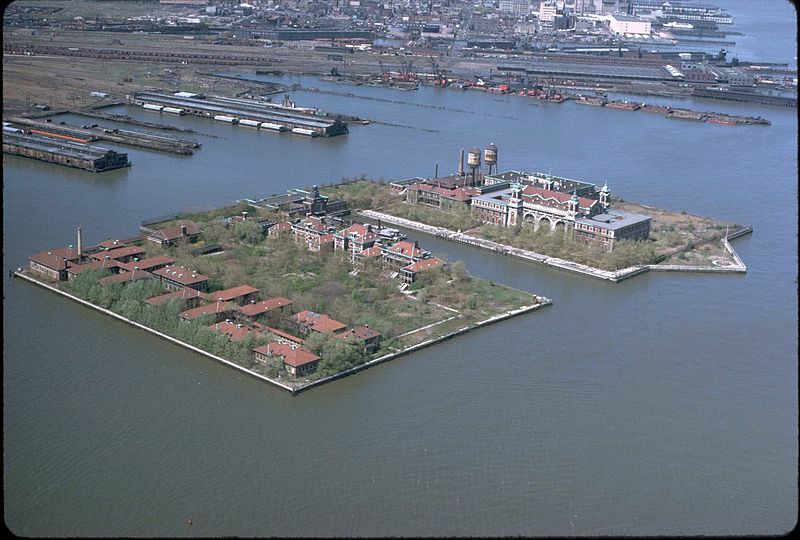 Let’s backtrack quickly: To understand the Court’s decision one must know that what we call Ellis Island is actually three islands, one of them natural and the other two man made. The immigration station was on island number one; this is now the museum that tourists visit today. The other two islands were hospital and administrative facilities; these are currently off limits while longterm plans for their rehabilitation come to fruition. Back to the story: In the late 1990s the Supreme Court rules that New York State can claim island number one because historically and culturally the island has always been considered part of New York. The other two islands, says the ruling, are indeed part of Jersey. You would think this would be a matter of semantics. After all, the immigration museum is managed by the National Park Service. In an interesting lesson on the intricacies of the matter, folks are getting up-in-arms because the governor of New Jersey intends to have his inaugural gala in the Great Hall–which falls on the New York side of the facility.